And the bank said the prospect of regional Asian trade deals and lending linked to China's Belt and Road projects "provided cause for optimism". "A large increase in reported profit before tax reflected both a healthy business and the non-recurrence of significant items from 2016," said group chairman Mark Tucker. While an stark improvement on 2016's results, the profit is still lower than the $18.9bn reported in 2015. 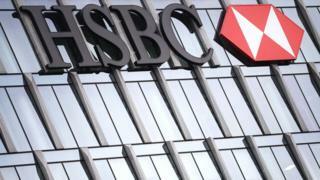 HSBC, Europe's largest bank, has been focusing on a drive to streamline its business and slash costs. Mr Flint, HSBC's former head of retail banking and wealth management, has said he wants to speed up the pace of change at the firm. The lender, which has its regional headquarters in Hong Kong, has also beefed up its presence in China's heavily populated Pearl River Delta area, lending to firms in the real estate and infrastructure sectors, and increasing its staffing. Across 2017, the bank said its pre-tax profits from Asia rose by 89.3% from a year earlier to $15.3bn - the bulk of its global profits for the year. Total revenues for the year rose 7% to $51.4bn, up from $48bn the year before. Despite the positive news on the bank's Asia-wide business, the firm's shares dropped as its overall results fell short of expectations. In Hong Kong, the bank's shares closed down 3.1% while in London, they were down more than 4% in morning trade. Laith Khalaf, senior analyst at Hargreaves Lansdown, said the appeal of HSBC's focus on Asia was clear, "with the Asian middle class set to balloon by a staggering two billion people by 2050". "However, this approach comes with risks attached. The strength of HSBC's share price over the last two years has a lot to do with better-than-expected economic performance from China," he said. "That's all well and good, but this cuts both ways, and looking forward if China sneezes, HSBC is going to catch a nasty cold."